Accidental overconsumption and uncomfortable highs from weed-infused foods are commonplace, especially among first-timers. Not only is it difficult to create even dosing across an entire batch of food, but the way our bodies absorb edible pot means that it can take over an hour to feel the effects, opening the door to accidental overconsumption. But what if that wasn’t the case? What if the dose of your next edible was as predictable as a couple of aspirin? That’s one of the promises of ultrasonic emulsification, or sonication for short, a technology borrowed from the pharmaceutical world that is starting to gain popularity. Ultrasonic emulsifiers, the machines that execute this process, look like the world’s strongest immersion blenders, and use high frequency sound waves to break cannabis concentrates down to a microscopic level. These tiny bubbles of pot are referred to as nanoemulsions. Nanoemulsions perfectly balance pot’s active chemicals across an entire batch of edibles. But these machines do more than just create an even mixture. 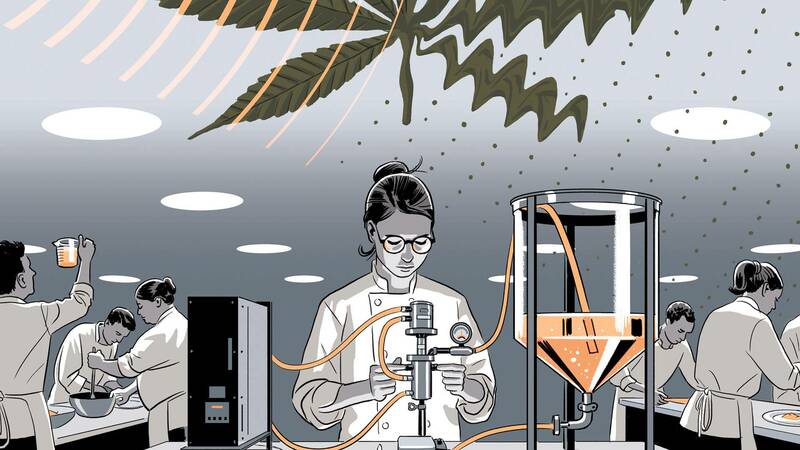 By breaking pot’s active chemicals down to a microscopic level, they fundamentally change how cannabis behaves. Cannabinoids, such as THC usually repel water, just like the oil in salad dressing, but in a nanoemulsion, they completely dissolve into H2O, allowing pot to be infused into any substance with water. These cannabinoids aren’t actually water-soluble—the nanoemulsion just creates a water-soluble appearance. But that’s good enough to trick our bodies into readily absorbing the cannabinoids straight from our gut to our blood stream. This is why pharmaceutical companies often use nanoemulsions. Sending drugs directly into your blood is considered more predictable and efficient than an edible’s traditional absorption route, which includes a slow chemical breakdown in the gut and liver. By avoiding those additional steps, a nanoemulsion allows cannabis to kick in quicker and reduces the differences that individual metabolism rates or diet can have on an edible’s effects, according to chemist Alexey Peshkovsky, the president of Industrial Sonomechanics, a company that has been selling ultrasonic emulsifiers for decades. He says the cannabis industry has quickly become his company’s biggest market. Erik Knutson, CEO of CanCore Concepts in Denver, began using the technology in 2013 to solve the problem of infused drinks separating. Using ultrasonic equipment, his company makes a line of sodas, sparkling waters and energy drinks. Ultrasonic emulsifiers also eliminate any taste of weed from the final product. So how does your weed get from a leafy green bud to a clear sparkling water? The first step is to create a cannabis concentrate. This is the process of removing the inert plant material from the bud and leaving behind a potent oil of pot’s active compounds, such as THC and CBD. This concentrate is then mixed with a “carrier oil” that helps form a more stable emulsion water. Certain carrier oils, such as corn or olive oil, have been shown to make nanoemulsions more readily absorbed into the blood stream. This oil is then mixed with water, and often a few other additives that further help stabilize the emulsion, and then is immersed in the ultrasonic emulsifier. These machines can range from a tabletop device made for small scale processing to lab equipment big enough to fill a small room that can quickly emulsify large batches of cannabis. They all work on the same fundamental principal: The emulsifier uses vibrations to send high frequency sound waves through the liquids, causing vacuum bubbles to violently explode inside the liquid and break up the cannabis oils into nano-sized droplets. in Washington, says these machines can be fascinating to watch. The machines start around $7,000 and can go up to $40,000. Employing a scientist to help design recipes is as important as the equipment, according to Andrea Coppola, a sales manager at QSonica, a Connecticut company that sells ultrasonic emulsifiers. Hull said he spent over $20,000 on ultrasonic equipment and an additional $3,000 on lab work while he was fine-tuning his recipe. But with the right recipe, the applications for this technology on different cannabis edibles seem almost limitless. Ultrasonic emulsification can be applied to liquid, solid and even inhaled cannabis products, Peshkovsky says.